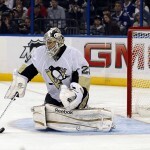 Fantasy Hockey Chateau Bow Wow: NHL Playoffs Beginnings? The NHL Playoffs and fantasy hockey used to go together like oil and vinegar but not anymore. While daily fantasy sites have not climbed aboard yet, there are enough websites out there to wet your pallet. The postseason is not a reason to hang up your fantasy hockey hat for the summer just yet. Hey, we have two months to go in a modified manner. However, there is that part of the column where we look back at what happened to end the longer part of the fantasy season. Friday was an indication that we would not say goodbye. Remember that the ending of most fantasy hockey seasons (daily, year, or dynasty) had some very unexpected results including “Mass Restings”. Let’s dive into that one first. Rest Before The NHL Playoffs? Yes this happened and it happened often. There was a comical instance of preserving an ironman streak tossed in for good measure. Everyone by now did see what happened in Chicago and Vancouver. 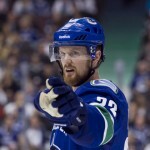 Whether Henrik Sedin’s 22 second shift will be something that soils hockey lore or not remains to be seen. However, watching Roberto Luongo get hung out to dry and torched because of all those resting players may have long reaching effects. What if Cory Schneider’s mystery injury keeps him out for Game 1, 2, or longer? As for the Blackhawks, they listed a slew of players on Saturday. They were not the only teams but they were the only teams to rest nearly a third of their respective squads. In contrast, Adam Oates played his guys against Boston and Washington’s Mike Green had three special teams points in the third period of a 3-2 OT win. It is an issue that for fantasy purposes only has one real outcome. PAIN! I understood what Chicago did but what a certain Vancouver coach did to unsuspecting fantasy hockey owners was just incomprehensible. One Last Fantasy F-U POTW! Granted, he did not play spectacularly bad and did win once in the final week but he was fascinated with the number three. In three starts, he gave up three goals each and every time. It was part of a very uneven April fantasy wise for Fleury owners. Overall, the Penguin goalie gave up 13 goals in his last four starts. Also, remember he took time off for the final week of the year and even that yielded mixed results. Everyone has last year’s playoffs ingrained in their minds and part of me tends to think it was in the back of Fleury’s head too. Whatever it was, #29 did not look the same and fantasy owners literally, to a man and woman were saying to me that they had dire concerns about this week and the playoffs. They were 100% right. What does it mean in playoff pools? It means at least a little bit of hesitation at first. No one knows what they are going to get until Marc-Andre Fleury plays a game. When you hear that Tomas Vokoun is expected by some pundits to win a game, maybe two in this first round, that raises the warning bells. What is going to happen in Round 1 later tonight of the NHL playoffs? Expect a lot of interesting surprises. Something tells me there will be at least one surprise by a road team and most importantly there will be fantasy craziness because it’s the cup! You can follow me @ChrisWasselTHW throughout the playoffs for unique fantasy pool advice and hockey banter. Thanks again for reading.